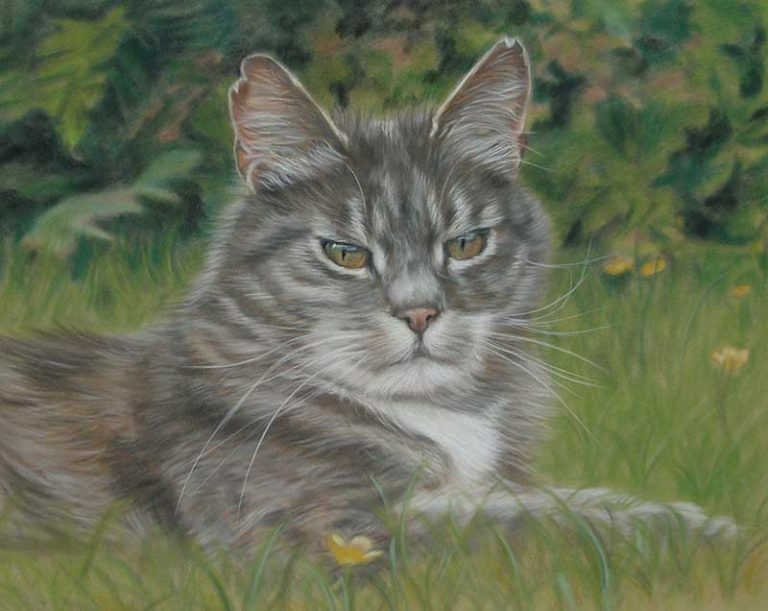 My cat portraits are available in a range of sizes, in both pastels and oils. Prices quoted on my prices page are unframed. I can can recommend a range of frames and quote and supply your portrait framed if required. Not only have I been a dog owner, but I also grew up with a cat called Tiger. He was a ginger tomcat and lived to be 24 years old! Cats can be so loving and want nothing more than to curl up with you, but also I know that some cats are more independent and want to be outside off exploring! Each cat is unique and has a personality of its own. It is important to me that I show this in my cat portraits. See below a recent testimonial for a lovely cat painting that I did for a client in the USA. These are just a selection of my previous cat portraits. Click any image to open a lightbox. To see more of my pet portraits please visit the Gallery page or follow me on Facebook or Instagram. Hi Lorraine. To say that we are blown away would be a complete understatement. You have capture the essence of Angel perfectly.